BBC News - The first glimpse of dark matter? The first glimpse of dark matter? 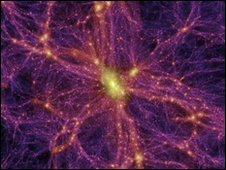 US scientists have reported the detection of signals that could indicate the presence of dark matter. A team announced on Thursday detecting two events with characteristics "consistent with" what physicists believe make up the elusive matter. The main announcement came from the Department of Energy's Fermi National Accelerator Laboratory near Chicago. The scientists were keen to stress that they could not confirm that what they had seen was definitely dark matter. "While this result is consistent with dark matter, it is also consistent with backgrounds," said Fermilab's director, Pier Oddone. Several US universities and institutes have contributed to the Cryogenic Dark Matter Search (CDMS), an experiment designed to detect the dark matter particles. The tests are being carried out in an underground laboratory in a defunct mine in northern Minnesota. "In 2010, the collaboration is installing an upgraded detector at the Soudan mine with three times the mass and lower backgrounds than the present detectors," said Dr Oddone. "If these two events are indeed a dark matter signal, then the upgraded detector will be able to tell us definitively that we have found a dark matter particle." It seems that ordinary matter - gas, stars, planets and galaxies - makes up less than 5% of the Universe. The remainder is unseen. Astronomers believe that 70% of this is "dark energy" - a hypothetical phenomenon that affects the rate at which the Universe expands. The remaining 25% is believed to be dark matter. Theories suggests that dark matter is made up of subatomic particles called Wimps - Weakly Interacting Massive Particles. These are thought to have a similar mass to the nuclei that give each atom the majority of its mass, but are predicted to "bounce off" rather than interact with any other matter. This would make the particles themselves impossible to find. So the detectors in the CDMS experiment are designed to pick up the tiny amount of energy that Wimps leave behind as they scatter - the only clue they might leave behind. Others hold that the dark substance consists of everyday matter, but that this ordinary matter, referred to as Massive Astrophysical Compact Halo Objects (Machos), happens to radiate little or no light. 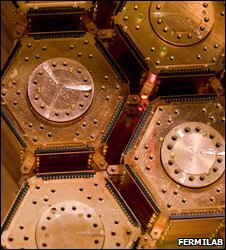 The CDMS scientists believe they may have seen evidence of Wimps - heat deposits left in silicon and germanium detectors that had been cooled to very near absolute zero (-273C). "Layers of shielding materials, as well as the half-mile of rock above the experiment, are used to prevent most of the background particles from reaching the detector," a Fermilab statement explained. Professor Carlos Frenk is a cosmologist from Durham University in the UK, who develops theories about the structure of the Universe. He described the results as "deliciously inviting". "Dark matter is what makes the Universe interesting," he told BBC News. "It is responsible for the bulk of the gravitational forces that give the Universe its shape." Professor Frenk said that the world of cosmology had been "awash with gossip" about the highly anticipated results for the past week. Commenting on why he felt the scientists had made the announcement before they could confirm their findings to be dark matter, he said that there was a competition among scientists to be the first to make the discovery. "This is one of the most important problems in science," he told BBC News. "We only have a glimpse here, but it's so tantalising that you couldn't go to bed without telling the whole world about it."